own copy of this DVD. 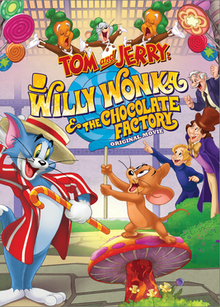 Tom and Jerry: Willy Wonka and the Chocolate Factory will be available to own on June 27, 2017, on Digital HD. Digital HD allows consumers to instantly stream and download all episodes to watch anywhere and anytime on their favorite devices. Digital HD is available from various digital retailers including Amazon Video, Cinema Now, iTunes, PlayStation, Vudu, Xbox and others.